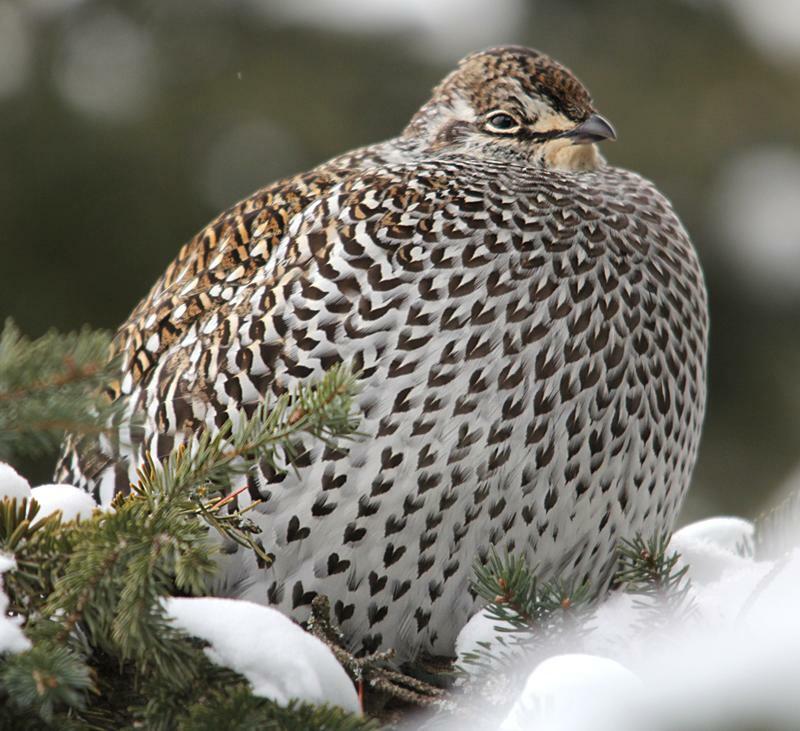 This grouse species, unlike our other grouse, prefers open habitats. There are two subspecies in Ontario, the Prairie subspecies (T.p. campestris), and the Northern subspecies (T.p. phasianellus). Although indistinguishable in the field, each subspecies occupies different geographic areas and having slightly different habitat preferences. Where available, it prefers undisturbed grasslands with scattered shrub cover, but in more heavily forested areas will readily use clear-cuts, burnt areas, bogs, grassy fens, open swamps, shrubby riparian areas and old fields. Up to a dozen males display communally on a shared parade ground called a lek, which is usually used year after year. Leks are usually on slightly elevated open areas with short vegetation. The normal range of the Northern Sharp-tailed Grouse in this part of Ontario ends just north of Timiskaming District. The southern boundary of its documented breeding range extends roughly in a line from Matheson to Marathon and along the north shore of Lake Superior. It occupies virtually all of northern Ontario north of this line. There are breeding populations of the Prairie subspecies in the Sault Ste. Marie area and on Manitoulin Island. In 1941, Michigan Department of Natural Resources made a planting of 37 Prairie Sharp-tailed Grouse onto Drummond Island from Michigan's Northern peninsula. Thence they spread east, and the first lek was found at the west end of Manitoulin Island in 1952. By 1960, these birds had virtually colonized the whole of Manitoulin Island. The Prairie subspecies has also been introduced into several locations in southern Ontario, most recently in the 1970s, where it has met with limited temporary success and in most cases has disappeared. The Northern subspecies generally spends the winter on its breeding range, and does not venture further south in most years. Like other grouse species, Sharp-tailed Grouse populations are cyclic. The cycle for this species seems to be about 10 years, with major peaks about every 30 years. The cycle seems related to the breeding success in the previous year, which in turn seems based on the abundance of grasshoppers and wild berries and the density of vegetation for nesting cover, which in turn may depend on precipitation. Peaks in population can last 2 or 3 years, often followed by a rapid decline. In years of peak abundance or significant food shortages, long-distance southward movements by large numbers sometimes occur. The two most notable such irruptions occurred in the fall and early winter of 1892 and 1932. In 1932-33, this species was seen as far south as Bracebridge and Bancroft. After a major irruption, remnant birds may remain far south of their normal breeding range for a couple of years. Though not explicitly documented, Sharp-tailed Grouse were undoubtedly present throughout most of Timiskaming District in those years. The most recent, though considerably less dramatic, irruption was in 1967. In keeping with the roughly 30 year cycle, 2011 may turn out to be another irruption year. January 3-12, 2011. One observed and photographed by Heather and Les Foss in Evanturel Township. Photos on file. Also photogrpahed by Serge Gendron.